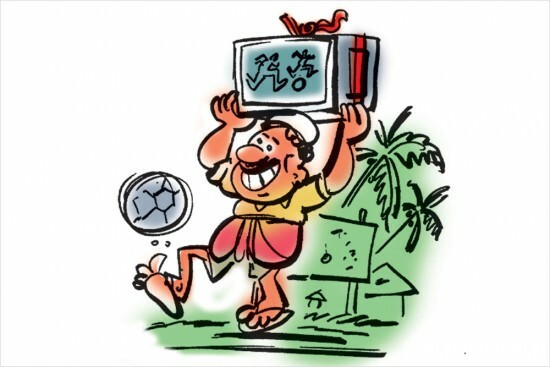 The World Cup has showered its bounty upon far-flung lands—­including Kerala. Demand for related merchandise is fuelling a mini-boom in the state, with obse­rvers predicting Rs 700 crore worth of business before the tournament is over. Such surges take place during every World Cup, but this is perhaps the biggest yet in Kerala. Fans are gobbling up goods such as footballs, goal nets, boots, socks, jerseys and the flags of competing countries. There is also much demand for flex boards that show support for a team (fav­ourites include Brazil, Argentina, Germ­any, Spain and Portugal) and taunt rival sides—one small printer has reportedly printed more than 250 boards, with over 175 having been made for Brazil supporters. But the biggest winners are television sets, with the sector reportedly seeing business worth over Rs 300 crore. Annaprashana? More like matsyaprashana. Traditionally in Manipur, the first solid food ceremonially fed to a baby would be ngahei fish—but this and other traditions are now under threat as native fish populations face extinction. This has been brought on by pollution, development and the introduction of high-yielding, non-local species in pisciculture. The state’s ecology has changed radica­lly over the past few decades under human pressure and neglect, with the all-important wetlands, of which there were over 300 in 1947, having mostly vanished. Thus, many native fish species have disappeared and several are endangered, with the International Union for Conservation of Nature having listed seven species from Manipur among ‘endangered freshwater fish species’. The crisis is so acute that it is near-impossible even to buy local fish in the market. So goeth the not-quite-divine command of the Young Mizo Association (YMA), a popular civil society group, to the Mizo people at large. This comes amid fears that thinly peopled Mizoram—it has around 11 lakh people, with a population density of 52 people per sq km, compared to a national average of 382—is being flooded with illegal immigrants from Bangladesh (via Assam), and Myanmar. “If you have a lot of space, it gets occupied by other people,” YMA president Vanlalru­ata said. Reportedly, he also lamented that annual population growth in the state was only about 1.5–1.7 per cent, arguing that with a greater population, Mizos could contribute more to the workforce and take up the thousands of jobs currently filled by migrant workers. Unfortunately, he didn’t add, “Lie back and think of England”. Old villages never die, they simply fade away. Or in this case, they fall into a bureaucratic black hole. In October 2016, a couple of years after statehood, Telangana reconfigured its districts, which increased in number from 10 to 31. The collateral damage was just small change, really—around 450 villages were mislaid. Some were on the borders of two districts, others had switched mandals, and still others had had their names changed. While these changes had been gazetted last January, they were not reflected in Census Department records. Census officials discovered the discrepancies recently and most have been upda­ted, but nobody knows where the 70 remaining villages have gone. One’s heard of doggy bags, but doggy boats? Fishermen are taking their boats out to Karachi’s ‘dog islands’ to feed the teeming islanders. Dogs inhabit dozens of such islands that lie offshore in the Arabian Sea just south of the port city. They are entirely dependent on the goodwill of the fishermen who bring them food and fresh water—but the only alternative may be death. The city’s feral canine population, which conservative estimates peg at about 35,000, faces a massive culling each year in a country where animal rights are at a low and religious doctrine engenders revulsion toward dogs. The islands serve as a refuge where hundreds avoid the slaughter. More than pebbles are at stake as Bhutanese stone mining in the Saralbhanga river on the border threatens the livelihood of Indian farmers, who maintain a jury-rigged stone dam on the river that allows water to be diverted to irrigate their farms. However, the increased mining activity from the Bhutanese side will “increase the current and flow of silt...the strong current will break our dam as we are not allowed to use cement, and the silt will destroy our paddy fields”, says a farmer. The villagers get no government help as the forest department says they are encroachers. Microfinance was never a panacea; it’s more akin to a pandemic. Predatory lenders are extracting their pound of flesh from Sri Lanka’s Tamils, many of whom turned to microfinance amid failed development initiatives and a lack of jobs after 2009. The fine print of these loans hid interest rates of up to 70 per cent. The debt crisis—linked to several suicides—has precipitated a mass movement. Protests took place across the northern and eastern provinces. Aut­­horities have respo­n­ded, with the finance ministry setting aside LKR 50 crore (Rs 21.2 crore) to relieve debts in the north, with a promise to write off interest on loans too. Are election manifestos becoming obsolete? So it would seem if one goes by the apathy shown to this important document by the major political parties in Pakistan. With barely a month left before the parliamentary elections scheduled for July 25, no major party has come out with a manifesto—neither the Pakistan Muslim League (N) of the Sharifs nor the Pakistan Tehrik-i-Insaaf of Imran Khan or the Pakistan People’s Party of the Bhuttos. Though major political parties have blithely ignored the manifestos, the religious party grouping, the MMA, has dutifully come out with one. In established democracies, the party manifesto is considered to be the most important part of an poll campaign. It is through this document that parties give their viewpoint on important national issues and announce a strategy to deal with challenges—a “published verbal declaration” through which parties express their “intentions, views and vision” about national issues and also make public their “motives” and “targets” which they plan to achieve. The English daily Dawn points out that a manifesto is actually a pledge a political party makes to the people before elections and later it acts as a gauge to measure its performance. “The manifesto is the best tool to make parties accountable,” the Dawn quoted Zaigham Khan, a senior journalist, as saying. But the newspaper report points out that in Pakistan, political parties publish only a few thousand copies of their manifestos before election. They consider it a mere formality and the document is only distributed to the media for a political debate. Since many parties have failed to function as institutions and due to the lack of ideology-based politics, even election candidates are often found clueless about the manifestos of their parties. It is interesting to note that only the religious-political parties’ alliance, Muttahida Majlis-i-Amal, has so far come out with its manifesto. The five-party alliance MMA, through its 12-point election manifesto announced on June 6, has covered almost everything, from local government to protection of Muslim minorities in other countries. The salient features of the MMA’s manifesto include ind­ependent foreign policy, enforcement of Shariat, land for landless peasants and jobs for locals in the projects being carried out under the China-Pakistan Economic Corridor. Unfortunately, major political parties are yet to show the same keenness in the matter as the MMA.